Kidou Keisatsu Patlabor: 98-Shiki Kidou Seyo! 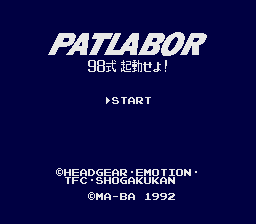 (機動警察パトレイバー ９８式起動せよ！) is a 1992 Sega Mega Drive adventure game by Ma-Ba released exclusively in Japan tying into the Kidou Keisatsu Patlabor media franchise. Main article: Kidou Keisatsu Patlabor: 98-Shiki Kidou Seyo!/Magazine articles.